Q. My daughter is extremely nervous of skiing. She had a really bad experience last year in another resort and is refusing to go to ski school. Can you help? Unfortunately this happens more than people realize – and yes we can help. Michel will firstly take time to talk with you and your daughter, to understand her fears and gain her confidence. When her instructor arrives for her lesson her fears will be explained again with him, and in front of her, and a plan will be made that she’s happy with. We encourage all children to speak to their instructors should there be anything they are unhappy about. For extra reassurance Michel is in permanent contact with all instructors via radio to check that all the children are doing ok and especially any nervous little skiers. Q My son is sporty and tall for his age – I don’t want him held back. I’d like him to start in a more advanced class as I know he’s a natural and will do well. We’ll listen to all your thoughts and on the first morning Michel will place him in a ‘comfortable’ group based on what you have discussed with us. Michel and the instructors are in permanent radio contact throughout the lesson and Michel will monitor the progress or any difficulties within each class. It’s quite normal for some talented beginners to jump a class in a week (and sometimes for older children even two). All children progress at various speeds, we appreciate that more than anyone, so movement between classes is all part of our normal week. Our main aim is for your child to feel happy in their group and to come away with the best achievement possible. Q. My son will be three when we’re thinking of going skiing – can he join your Toton class? He’s still young but we have an open-mind on this and if he’s keen we’ll do our best. The biggest challenge for the really little ones is stamina, which is why we give them just one hour a day in the morning whilst they’re fresh. We find that within the hour they can pick up the technique quite quickly without getting too tired. We keep repeating it, but each child is so different which is why we treat them all as individuals – you’d be surprised by the number who have progressed onto a blue run by their third day. 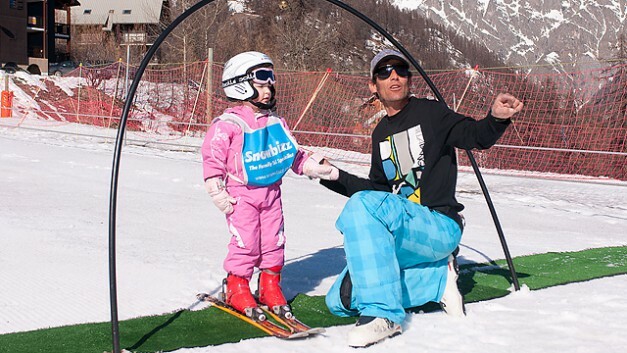 Just like the Junior Ski School the key is to constantly monitor each child’s progression during the week to make sure they get the most out of their experience. Q. My husband wants to go to a bigger resort but I’ve been recommended to you by a skiing friend who says we’d be mad to trust our daughter’s first time on skis to anyone other than Snowbizz. Although Puy isn’t linked into other resorts it has enough varied and challenging runs both on and off-piste for not only your husband but your whole family, but the key to the success of this holiday is going to be how your daughter takes to skiing. Your friend is only saying what hundreds of other friends have repeated – we are very grateful and proud of our reputation for making first-time skiers a truly happy experience. Q. My eight-year-old wants to board but we want him to perfect his skiing first, what do you recommend? A workable compromise would be to book Junior Ski School in the morning then 2 or 3 private boarding lessons in the afternoon will be plenty enough to get him going. The multi-glisse package will save you money on ski/board rental and for that you will get top of the range skis, boots, board and boots.